This entry was posted in Identity Theft Insurance, Identity Theft Protection on 10/19/2017 by Alejandra Vazquez. Discovering the signs of a break-in to your vehicle causes plenty of stress. When you discover a shattered window or the door wide open, your first thought is likely to call your insurance company. While it’s a good first step, your second step should be to determine how much of your identity has been compromised in the theft. 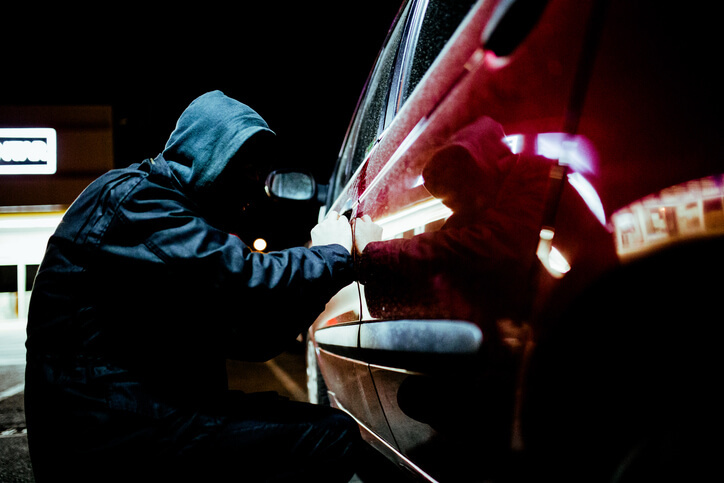 There’s a surprisingly strong link between car theft and identity theft. Even comprehensive insurance policies don’t necessarily include identity theft insurance related to a break-in or theft, so it’s essential to take out these policies separately to start the recovery process as quickly as possible. It’s required in most states that you carry printed proof of insurance coverage and registration in the vehicle itself. Unfortunately, your car insurance paperwork and other related documents tucked behind a visor or in the glove compartment may contain sensitive information that a criminal can use for identity theft purposes. Aside from documents you store in the car, electronics like a smart phone or laptop left on the back seat are often the target for the break-in. Not only are these devices easy to resell to make a profit, criminals can crack the devices to access personal data stored on the hard drive. Identity theft protection is the only kind of insurance that helps with the specific costs of recovering from this kind of loss. Experienced car thieves know all about what’s valuable when it comes to automobiles, and it’s often the information contained in the car rather than the parts or vehicle itself. That’s why identity theft insurance is being included more and more in many auto insurance policies. Even if a thief is trying to take the entire car or wants to remove the stereo from the dashboard, they’re likely to grab paperwork or your wallet in the process as well. A copy of your driver’s license, your passport that you forgot to file away after your last trip, and pieces of important mail all end up in the hands of criminals who know how to use the information, or at least know where to sell it for a profit. While some comprehensive car insurance policies do include identity theft components, it’s rarely offered and usually comes with plenty of limitations on the type of compensation included. You should never assume that identity theft, or even physical item theft, is included in your auto insurance policy. The theft of laptops and other items from inside your car is more commonly covered by a homeowners insurance or renters insurance policy instead, and neither of these policies automatically include identity theft protection, either. With over 700,000 cars a year stolen and nearly as many break-ins reported per year, there’s always a chance that you’ll face this problem. Starting up an identity theft insurance policy now gives you peace of mind that you can afford credit restoration fees after discovering someone has taken out a credit card in your name or used your details to commit another crime. Get an insurance quote from Freeway Insurance today by calling (800) 777-5620.